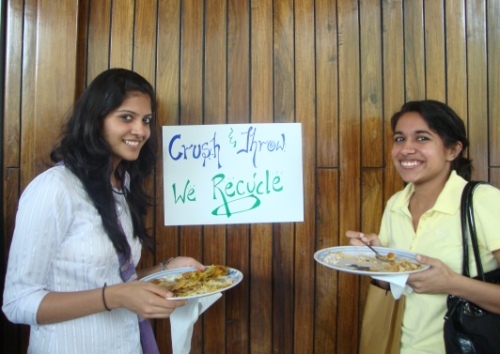 With the green wave going strong, more and more people are adopting an eco-friendly lifestyle. Innovating ways are being searched by many for keeping their ecological footprint low to help the Planet. One aspect of daily life which has a tendency to increase the footprint is the hosting of events, be it social gatherings, conferences, seminars or parties. There is therefore a lot of talk about making events green and consumption neutral. Delhi Greens Blog presents to you the following green tips to help you green your events and help save our environment this New Year onwards! Choose event location wisely: Select an event venue which is convenient for guests to commute by public transport (Metro, Bus) or on foot. If the event venue is not your home/office, make sure you do some research in which parts of the city your guests are coming from and choose a location accordingly. Send e-vites and choose e-promotion: Send invites using email/ SMS and save paper in the process. This will help save trees and keep the Planet green. Event promotion may also be carried out using New & Social media, radio broadcasts and placing ads in newspapers. Minimize the use of paper. Ask for gifts wrapped in newspaper: If you are expecting your guests to bring you gifts 😉 , do remember to add a note in your e-vite asking them to not wrap gifts in plastic or shiny paper. Gifts can be wrapped in newspapers or used papers. Decorate creatively, avoid plastic:Use recycled or reusable material for decoration purposes and avoid the use of plastic to a bare minimum. You can also promote ‘waste-to-wealth’ approach which is a source of revenue for certain grassroots organisation working on waste. Be an Energy Efficient Star-Host: Keeping the lighting low and choosing a venue which has natural lighting helps save energy to a great extent. You can host events out in the sun during winters. Ensure projectors and other equipments are turned off when not required. Inaugurate with planting a tree: or watering a plant. If your event is a landmark one, or is the beginning of a new phase of your life/ work, you can begin it by planting a tree. If the event is in the inside of a building, you can inaugurate it by watering a plant. Provide water smartly:While you must ensure that water is available to the guests in required volume, it is equally important to ensure minimum wastage of water and that glasses are made available instead of plastic cups. These can be cleaned which also helps generating employment. Organise/ Order food wisely: Order food only after getting a good idea of the quantity required. Try to arrange for organic food and avoid packed food material altogether. Ensure only locally available food material is provided to keep the event footprint low. Recycle badges and conference kits: If your event requires to give kits and badges to the participants, make sure these are made from recycled paper and are collected after the event for reuse/recycling. Give away plant saplings as return-gifts:What could be a better return-gift then to give a plant sapling which grows with time and reminds your guests about the event long after it has taken place. Spread the greens! And an extra one: Educate and make your staff, helpers, organisers and guests aware about why you chose to make your event green, and sensitize them about the environmental crisis and the need to help the Planet in sustaining us and the generations to come! Go Green 2011!